Howdy, folks! It's time for the second installment of my Antarctica trip report, documenting my surreal voyage to the 7th Continent last month. If you missed the introductory post from a couple weeks ago, I recommend you read that first, since it provides some background and framing for the trip. Plus, there's information to start you off if you might be inspired to embark on something like this on your own! When we last left off, we had been sailing for two days across the unpredictable Drake Passage. Per the advertised itinerary we looked at when my friends and I first booked the trip, this was officially day 4 of the trip and day 3 of the cruise itself. The first day had been the arrival to Ushuaia, followed by actual embarkation onto our ship, the Ocean Diamond, on "day 2." "Day 3" and "Day 4" were to be transit days across the Drake, with our exploration of Antarctica slotted for "Days 5 - 8." Imagine our surprise when, on the early afternoon of "Day 4," we were notified by public address that we were nearing our first landing, and that we'd be going to land in just an hour or so! First sighting of land in two days. 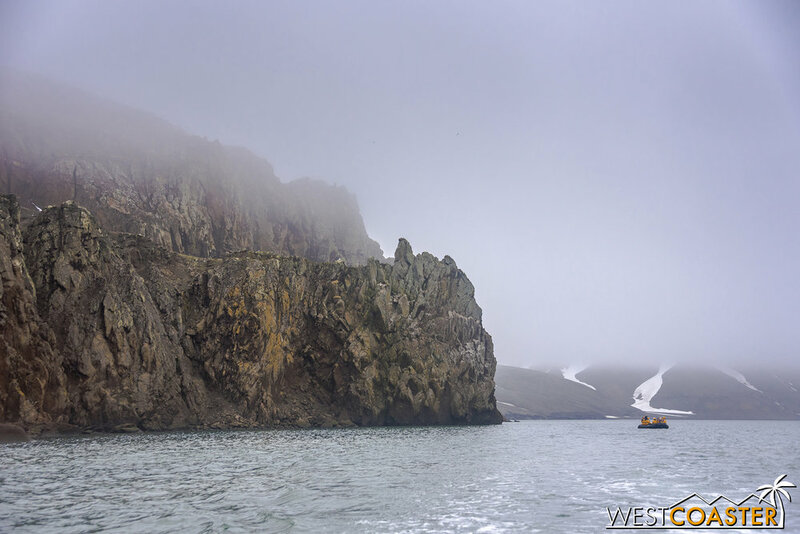 As it turned out, we had crossed the Drake Passage and had reached the South Shetland Islands, an archipelago off the northern tip of the Antarctic peninsula. Our destination this afternoon was Deception Island, a C-shaped isle created by the caldera of a still-active volcano, with a sheltered harbor hugged by the terrain wrapping around the underwater crater. Deception Island was first discovered in 1820, by British sealers William Smith and Edward Bransfield. In the ensuing years, it became a haven for seal hunting, until the massive slaughter depleted the seal population, leading to the island's abandonment. 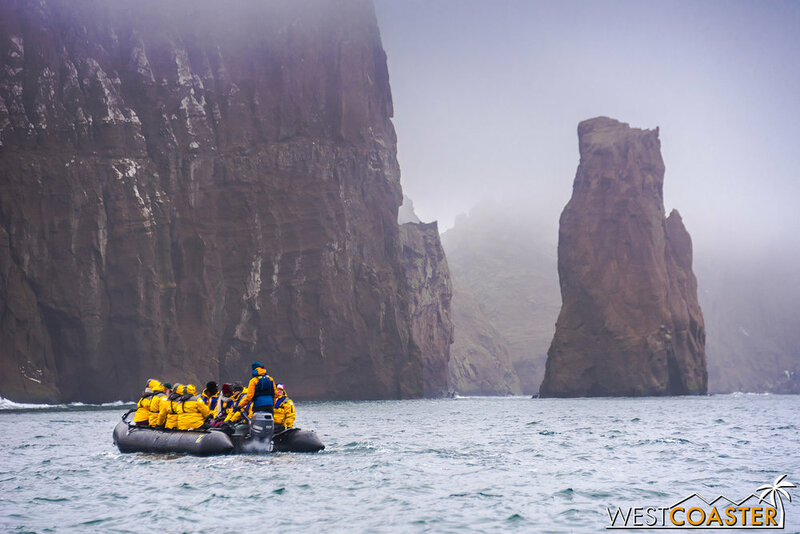 There was some scientific exploration in the ensuing decades, including the discovery of its volcanic nature, but by and large, Deception Island remained free of human influence. In the early 20th century, however, it became a home for whalers that would haul their prize to the island to be processed aboard floating factory ships. Whaling proved to be a profitable venture for the next couple decades, which brought the British in to claim the land as theirs. In the 1920s, though, new advances in whaling enabled ships to process whales while asea. Not only did this free whalers from being tied to land, it also placed whaling activities away from the eyes of governments that could catalog the hunts and tax them. As a result, however, Deception Island was once again abandoned. Ruins of various buildings lie along the beach at Whalers' Bay. These include old whaling boilers. Whale bones are another sign of the old whaling history of the island. Deception Island saw human activity in the middle of the 20th century when Chile and Great Britain established bases. These lasted a decade or so, but once again, regular human presence was not to be. A volcanic eruption in 1967 and a second eruption in 1969 destroyed the scientific bases that had been established there. The island has also seen its share of scientific research bases established also, with half of them lost to or damaged by the 1967 and 1969 volcanic eruptions. Today, Deception Island features a couple of summer-only bases, but it is by and large uninhabited. However, it is a popular tourist destination of many Antarctic operators. The volcanic geography creates a dramatic setting, and the black sand is surprisingly warm, owing to the geothermal activity. Colonies of chinstrap penguins also call the island home, as do at least a couple varieties of seals. 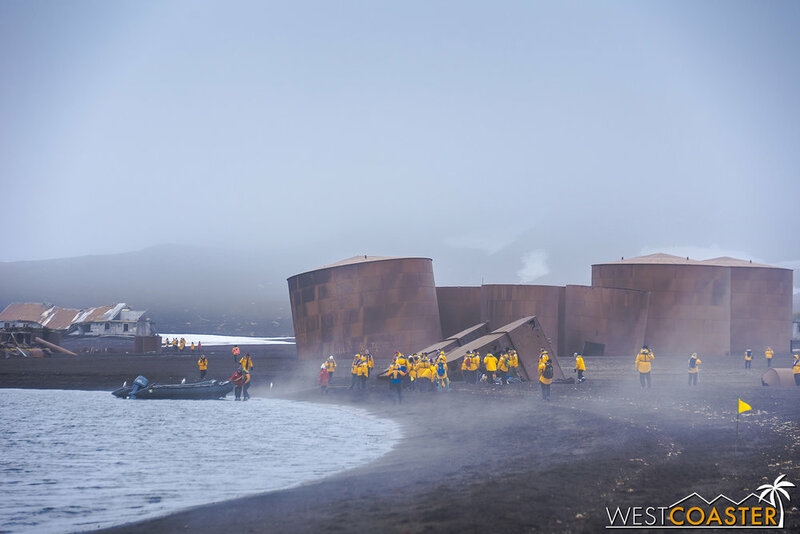 Most dramatically, however, are the ruins of the old whaling structures--including rusted boiling boilers and tanks--an old airplane hangar, and the remnants of the scientific bases that were mostly wiped away by the 1960s volcanic eruptions. An old airplane hangar sits in deteriorated condition. It was a gray and cloudy afternoon as we made our way toward Deception Island, but this was okay. The island is so unique and mysterious looking that the misty skies seemed very fitting. As we approached the entrance to Port Foster, we could see the dramatic, high peaks framing Neptune's Bellows on either side of the narrow inlet into the watery interior of the island C. Neptune's Bellows is relatively narrow--less than 800 feet wide, and has a barely submerged underwater rock called Ravn Rock that ships must avoid as they enter. This required expert and precise navigation by our captain to ensure a safe passage. The narrow opening of Neptune's Bellows also hides a treacherous underwater rock that must be avoided by incoming and outgoing ships. Once we were inside guarded waters, we took a turn to the right into Whalers' Bay, a sort of lagoon within the greater Port Foster harbor. There, the Ocean Diamond dropped anchor, and we prepared for our first Antarctic landing! The Antarctic Treaty System limits the number of people who can be on land at any Antarctic site to 100 at a time. This means that at any given time, when a tourist ship reaches a site, it can only allow 100 staff and tourists combined. On board the Ocean Diamond, this was handled in a relatively simple manner. The boat itself had 187 total passengers, and so they were split into four groups of around 45 guests each. Two groups of guests--plus their Quark expedition guides--would go on land at a time, while the remaining two groups did cruises around the bay. Guests who had signed up for kayaking would go with the groups on cruise. After an hour to an hour and a half of time, the groups switched. In this way, we could explore the site on foot and also see it from the water--a complete experience! Heading to shore for the first time on the Zodiacs! Our method of transportation to physically reach the shore or cruise around the water was Zodiac inflatable boats. These rugged, low-emissions motorized vessels could fit 10-12 passengers plus a guide. Think of what Navy SEALs board when they conduct missions and landings on a beach. On cruises, Zodiacs cruised in groups of 2 or 3 for safety purposes, employing the "buddy system" manner of looking out for each other. To land, Zodiacs went as they loaded, since the destination was direct and in full line of sight of ship staff. Our group was among the two to make landing first and cruise second. So it was mid-afternoon when we stepped foot on the volcanic sand beach of Deception Island--our first landfall in Antarctica! 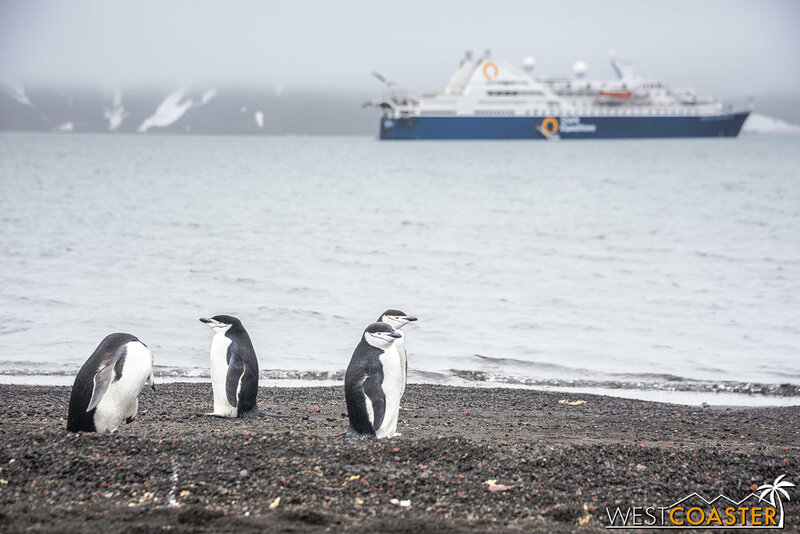 A group of chinstrap penguins greeted us when we arrived, curious at the group of yellow-bodied figures disembarking from the black, rubbery watercraft. Penguins do not have any natural land predators, so they simply stared with quizzical expressions that were devoid of fear, then continued waddling along their way. "Chinstrap Charlie" (not his real name) greets folks on shore. Chinstrap penguins are characterized by the thin black band that goes under their beaks. Like a chinstrap. The penguins are subject to numerous photographers and photo takers. On land, we had a choice of two options--and most likely not enough time to do both. To the left, we could explore the old ruins and take a history walk with our cruise's resident historian, David. This would provide a closer look at the old buildings and provide insight into the scientific and whaling history of the island. To the right was a path that lead to a hill that led up to Neptune's Landing, a high overlook point with a view out to the sea beyond as well as the harbor from which we came. Figuring that I could always learn about the history of the island via other sources, while the view would be something I would not be able to experience again, I opted for the path to the right. 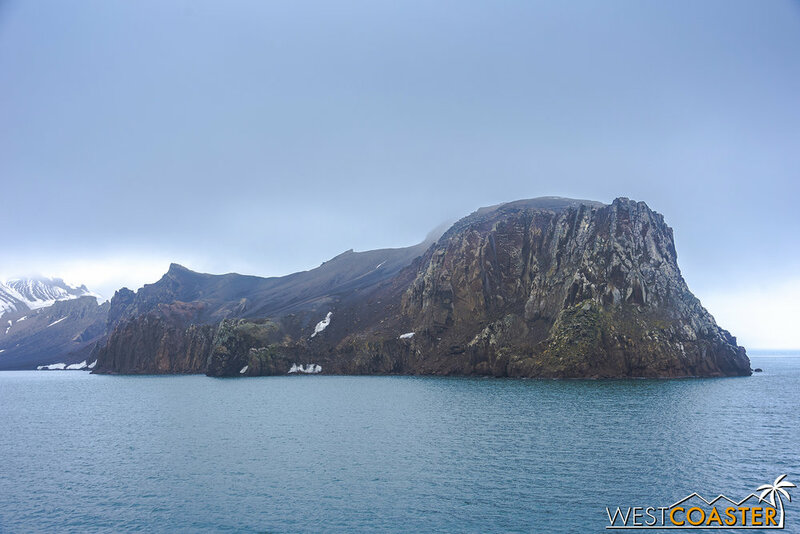 We passed a few more "chinnies," as we affectionately came to call chinstrap penguins, as well as scattered whale bone remains, before coming to the end of the coastal part of the path and the start of an ascent. Heading to the right, toward Neptune's Window in the background. Just beyond the flags marking the boundary of where we were allowed to traverse, we saw a leopard seal sleeping the afternoon away after presumably a nice, filling meal. She yawned a few times but mostly kept relatively still, enjoying the afternoon nap. 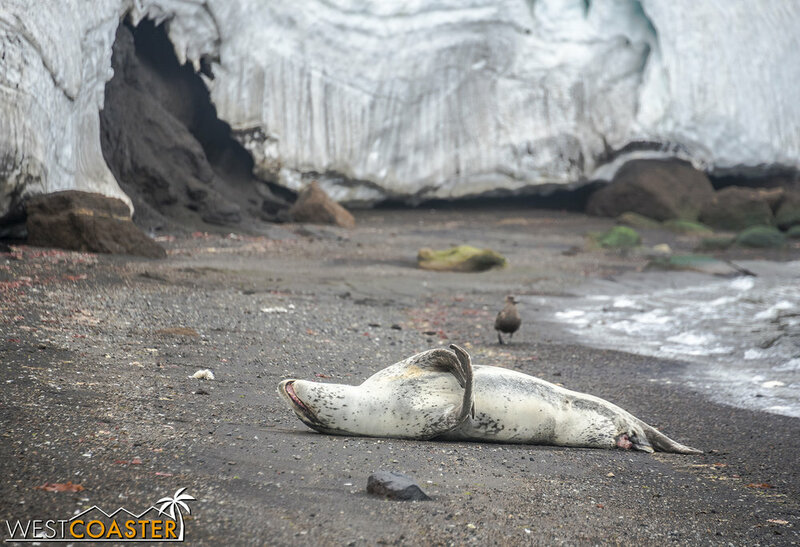 A leopard seal enjoying an afternoon siesta. The trudge up to Neptune's Landing wasn't really that challenging. It was just a straight uphill. But the sandy soil and the heavy, multi-layered winter clothes we had on did provide a little more than an easy saunter up. Towards the top, we had to be careful of our footing, as the last bit to the landing itself was a little more steep and unstable. The hike up to the overlook of Neptune's Window. Once we made it to the top, however, we took in the moody and mysterious view to the sea beyond--all bathed in white mist and clouds--as well as the sweeping harbor view behind us, and the ruins across the beach area where we had landed. By this point, we realized that we would not have enough time to go back down, walk back to our landing, and then continue further to explore the ruins. So we took our time and enjoyed the view, the breeze, and the fact that we had made our first stop in Antarctica! Gazing out to sea from the viewpoint of Neptune's Window. The mistiness and somewhat foggy air seems right for ethereal Deception Island. The hike down was a reverse of the way up to Neptune's Landing, and we had a few run-in's with some chinstrap penguins going back to our Zodiacs. They were adorable little fellows, meandering their way along the sand, coming close to but circling around the tourists in their path. As much as I wanted to just hug one, I had to keep my distance. Under the agreement to the Antarctica Treaty that all Quark passengers signed, we needed to keep 5 meters or 15 feet away from the majority of wildlife we encountered, with even greater distances away from certain select more dangerous or more endangered species. Fortunately, if we happened to be standing or kneeling still, and a penguin came closer than the 5 meter distance, we could simply stay still observe. But unfortunately, penguin hugging was expressly off the list of allowable actions. Ah well. 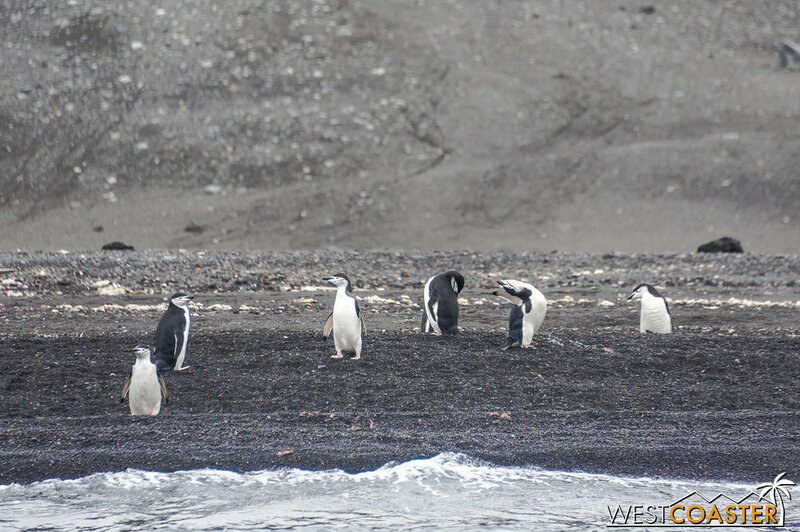 Back on the beach, numerous chinstrap penguins rest. Except for this busy walker/waddler. Kayakers make their way across the water, as the Ocean Diamond sits anchored beyond. 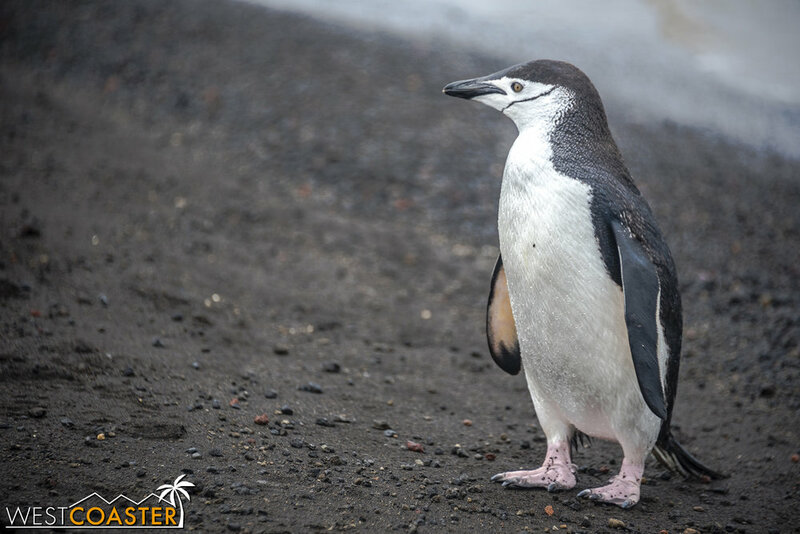 Our cruise through Whalers' Bay brought us close to a variety of additional penguins, seals, and some sea birds. See could see additional whale bones littered along the sand--morbid relics of the island's past. 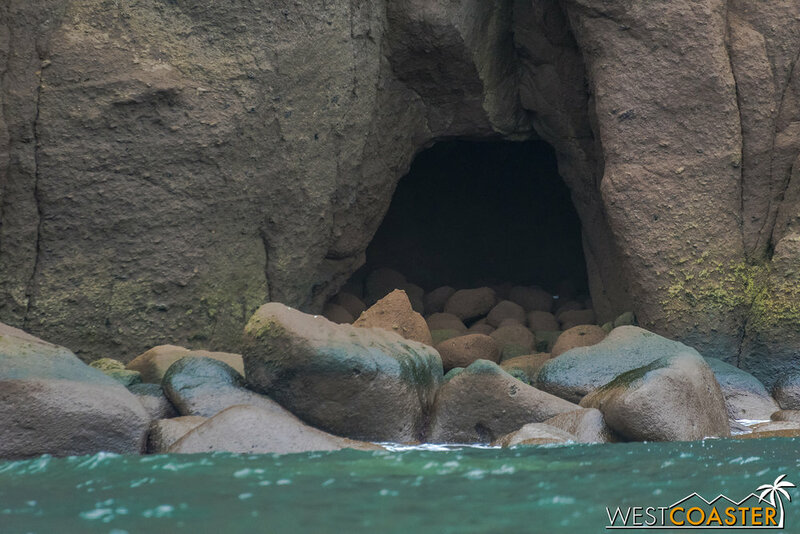 We cruised by the towering rocks of Neptune's Bellows and near Neptune's Window, and passed by the other side of Whaler's Bay--where we saw small cascades from snowpack and observed colorful red and green lichen on the rocks. We even passed the remnants of an old shipwreck near Neptune's Bellows, a reminder of the treacherous waters that still might spring forth at a moment's notice. 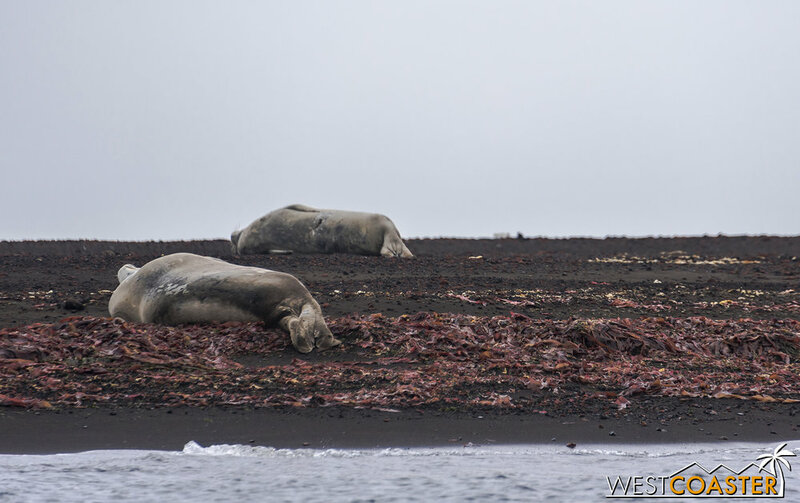 A Weddell seal lies along the warm sand. More chinstraps play by the water. One of many seabirds spotted at Deception Island. Comorants, skuas and gulls, mostly. The cruise was not quite as exciting for me as the hiking, relatively speaking, but it was still fun. Seeing the wrecked ship up close was pretty neat, and the texture of the geology all around us was fascinating. I thought about how amazing it was nature's forces could craft such dramatic looking rock, and what violent episodes must have taken place previous around this sea-bound volcano! After an hour, it was back to the Ocean Diamond to decompress and get ready for dinner! 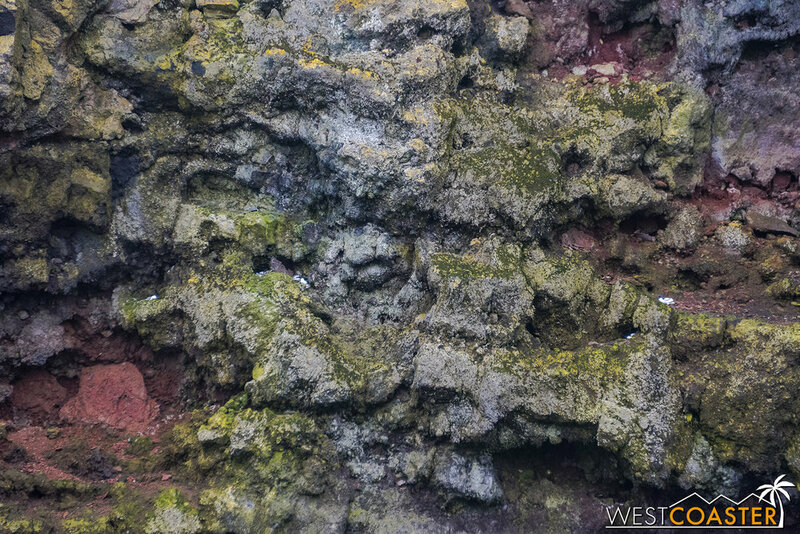 Both the green and red coloring of the rock comes from lichen. 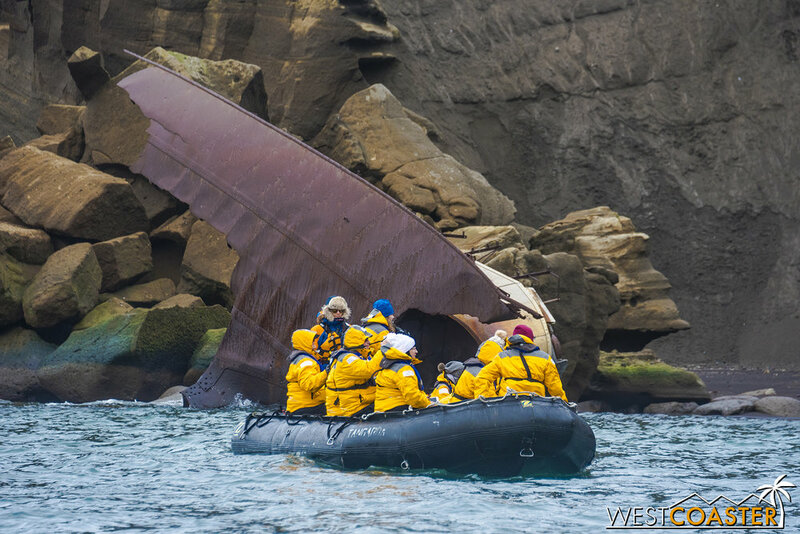 Two Zodiacs' worth of explorers check out the wreckage of an old ship. 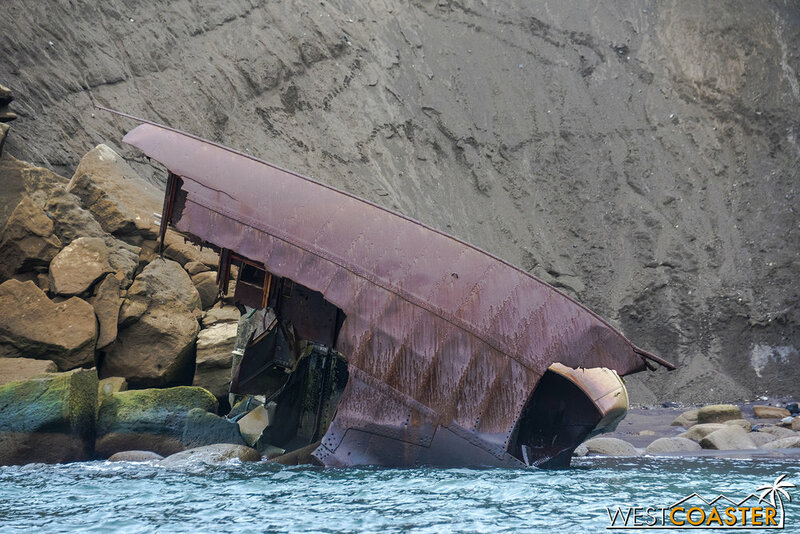 Close-up of remnants of the shipwreck. Our stop at Deception Island ended up being a welcome surprise bonus, because we hadn't expected to make any landing until the following day. The fact that it was Deception Island was also a cool moment for me, because it was the only destination I had been aware of prior to the trip, so I had been looking forward to seeing it in real life. Deception Island may not have looked like stereotypical Antarctica, but it was representative of what the continent had to offer: rugged wilderness of all types, often in surprising and unexpected fashion. This would be one of ultimately nine different sites we would visit on our trip to Antarctica--an incredible number given the unpredictability of weather and conditions on the continent, even during the summer. We didn't know we'd be able to make so many visits at the time, but the first stop was certainly off to a great start! Where would the second landing be...? The towering rock on the side of Neptune's Landing cuts into the low hanging clouds. This series will recap every stop along my Antarctica journey, so check back soon for the next installment!